From at least the time of the Council of Trent, the usual venue for the celebration of the Sacrament of Penance has been the confessional situated in a church or oratory. In the traditional confessional, the priest and the penitent remain in separate compartments and they speak to each other through a grill, screen, or lattice which is often covered by a veil. In many confessionals, the confessor sits between two compartments, each of which has a kneeler for a penitent. The priest is able to close off one of the penitent’s compartments with a sliding screen so that only one penitent will be confessing at a time. The confessional admits of a variety of styles from simple and austere to magnificently carved wooden structures. It may be designed with or without doors and with or without curtains. In all of its design variations, the confessional is essentially intended to afford anonymity to the penitent. It also serves to protect both the penitent and the priest from unchaste touch and from false accusations. 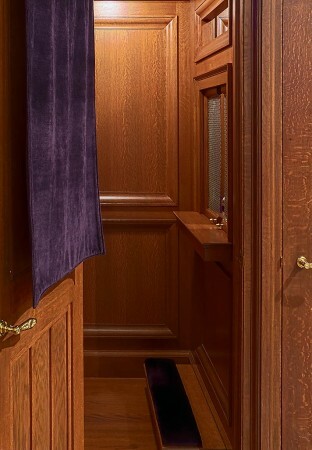 The traditional confessional box nonetheless permits a kind of sacred intimacy in which the penitent confesses sins to God through the priest who acts in persona Christi. While the proper place for hearing confessions is a church or oratory, canon law foresees that for a just cause confessions may be heard in a wide variety of places outside of a confessional located in a church or oratory. For example, confessions are routinely heard in hospitals, rectories, and, in military situations, even on the field of battle. The plentiful opportunity for sacramental confession permitted by canon law is grounded on the principle of the salvation of souls which is the supreme law of the Church (salus animarum est suprema lex). 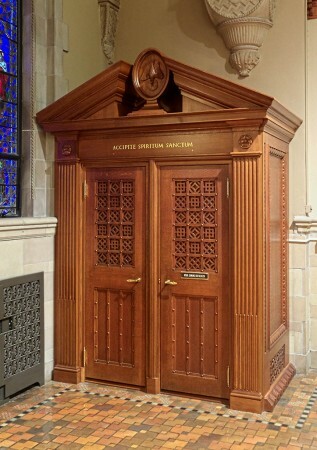 The essential design of the traditional confessional reflects long established concerns of the Church for individual dignity and the good of the community. In her wisdom developed over the many centuries, the Church has distinguished between the internal and external fora. The internal forum pertains to matters of conscience, and it involves confidentiality in both sacramental and non-sacramental communications. In contrast, the external forum involves all matters, such as an act of governance, which are public and verifiable. The confession of sin belongs to the internal forum while the question of guilt of an ecclesiastical crime is generally suitable to the external forum of a canonical trial. The traditional distinction between the internal and external fora reflects a balance between the common good and an individual human being’s right to privacy and good reputation. Even during the early historical development of the Sacrament of Penance, which was characterized by public and communal acts of penance, there is reason to believe that specific sins confessed to a priest remained part of the secrecy of the internal forum. In addition to protecting a person’s rights to privacy and good reputation, the Sacrament of Penance developed in the Church with the wisdom gained from extensive experience that the secret auricular confession of sins helped to avoid unnecessary and damaging scandal in the community. The traditional confessional has long served to enhance these goals. Canon 909 of the 1917 Code of Canon Law stipulated that the confessional must have a thin, fixed, and perforated screen between the penitent and the confessor. Vatican II called for the revision of the rites for the celebration of the Sacrament of Penance in accord with the social, communal, and ecclesial dimensions of the sacrament’s historical development. During the post-conciliar years in the implementation of the revision, the opportunity for face to face confession was often emphasized. It remains true that many penitents prefer this method of confessing one’s sins. The face to face approach has been described as more personal, less formal, and less frightening for those who seek a conversation with the priest. Section 2 of Canon 964 of the 1983 Code of Canon Law leaves it to national conferences of bishops to establish norms for the confessional, but requires that “there are always confessionals with a fixed grate between the penitent and the confessor in an open place so that the faithful who wish to can use them freely.” The United States Conference of Catholic Bishops has called for a “small chapel or rooms of reconciliation” that permit penitents to choose between the traditional anonymity of confessing through a screen or the opportunity for a “face to face encounter” with the confessor. However, recent developments in the Church’s experience suggest that a retrieval of the important values served by the traditional confessional may be in order. It may well be time to reconsider whether the reconciliation room presents more problems than advantages. The sexual abuse crisis has painfully reminded all of us of the reality that priests are human beings like all others who, as a result of original sin and their own personal limitations, sometimes may fall in violations of the sixth and ninth commandments of the Decalogue. The separation of the penitent and confessor in the traditional confessional tends to create a sacred space that militates against the commission of sin. One reason for this is that the parties cannot see or touch each other. Chastity in sight and touch are, of course, essential to that deeper purity which is to characterize the imitation of Christ by both priest and penitent. Another reason is that the traditional confessional facilitates an intimacy that is nonetheless ordered to the matter of the Sacrament of Penance. The modern reconciliation room often encourages a wide-ranging conversation more akin to pastoral counselling or spiritual direction. In contrast, the traditional confessional suggests to the parties that the purpose of this sacred space is specific to the confession of sins, expression of contrition, resolve to sin no more, performance of penance, and the administration of absolution. Recent developments also suggest that the traditional confessional may advance important legal and societal functions. The traditional confessional assists in protecting the priest from false accusations. In churches and oratories which are open to the general public, anyone may enter a reconciliation room and subsequently bring an accusation against a confessor. The sexual abuse crisis has resulted in an atmosphere in which the presumption of innocence of a criminal act is often abrogated. A priest accused of sexual abuse may be viewed as guilty once the accusation has been brought against him. When a priest is alone with another person, especially if that person is a minor, the priest is vulnerable. The physical separation of the traditional confessional renders accusations of inappropriate touching or looking highly dubious. Priests need to be fearless in the offer of their humble service to the faithful, but they also need to be prudent to avoid any situation that might cause scandal. Additionally, the sexual abuse crisis has raised questions about the value of secrecy. Generally, state law protects confessors and other religious ministers from being compelled to divulge information that is communicated to them by a penitent. More than a few persons in secular society have been inclined to question any exemption that a confessor might enjoy under state law. They ask if a priest hears about some criminal matter in the Sacrament of Penance why he should be exempt from reporting requirements adopted by the state. The anonymity of the traditional confessional means that the priest often does not know who is confessing. Although it is sometimes possible to know a person through voice, the reality remains that in the separate compartment and behind the veil of the traditional confessional, the confessor most often may simply have no idea of the identity of the penitent. If the priest does not know the identity of the penitent or if he has a lack of certainty about a penitent’s identity, he cannot justly be held to state reporting requirements about abuse or other types of crime. The traditional confessional thus serves to safeguard the inviolability of the seal of the Sacrament of Penance. The seal of the Sacrament functions to ensure the faithful that they may freely confess their sins and receive God’s forgiveness without the danger of public revelation by the confessor. Finally, the traditional confessional conveys an important message to the Church and society as a whole. It communicates that the Sacrament of Penance is a sacred and privileged place, which is not susceptible to the further commission of sin but is a source of the divine healing that comes from the reception of God’s forgiveness. In the design of a new church or oratory and in the restoration of an already existing structure, ecclesiastical architects may wish to use their skills to affirm the perennial values protected by the traditional confessional.